Keep up to date with everything that is happening here at dBase LLC. dBASE PLUS 8 has already been well received by a truly global customer base. The dBASE product generates just over forty percent of gross revenue from international sales. dBASE PLUS 8 continues to provide valuable tools that developers, business analysts, and users from around the world have come to depend on each and every day. The new dBASE PLUS 8.1 with ADO is here! Now German, Japanese, Italian, and Spanish speaking customers can use dBASE PLUS 8.1 in their native language. dBase, LLC introduced a brand new updated and upgraded dBASE back in March, and today we are proud to announce the new dBASE PLUS 8.1 version. We are very excited to be offering such a significant release in the same calendar year as dBASE PLUS 8.0 What makes version 8.1 so great? Well a few things. First, this new release adds some significant new functionality for the dBASE product that the community has been requesting. In addition to the new features, the 8.1 release also includes all the fixes and updates found in 8.0 through 8.0.0.5, plus, we have fixed another round of reported issues with this release as well. To remind everyone of our upgrade policy, dBASE PLUS 8 with ADO is a MAJOR RELEASE, which means ALL upgrades to dBASE PLUS 8 with ADO have to be purchased unless your purchase of dBASE PLUS 2.8 fell within the 30-day grace period of the March 19th release date. We hope you like what you see. Purchase a new license of dBASE PLUS 8.1 with ADO here for $399.00 USD, or purchase the upgrade of dBASE PLUS 8.1 with ADO here for $299.00 USD. Purchase the dBASE PLUS 8.1 Personal Edition* here for $199.00 USD. We told you this was a new dBase, now we need all of you that are sitting on the fence to BUY NOW! This is a great opportunity to get the latest and greatest in dBASE application development and there is no better time than now. Again, we appreciate your feedback regarding dBASE PLUS 8 and are committed to making dBASE a platform worth your time and investment well into the future. We are listening to you and we do care. *Personal Edition does not include ADO. Declare Your Independence from your old version of dBASE! • Ten percent (10%) on the dBASE PLUS 8 with ADO Upgrade Edition*. In addition, if you need the CLASSIC™ dBASE products including dbDOS™ and dBASE CLASSIC™ there is no better time to purchase, than NOW!. • Get the dBASE CLASSIC Bundle* for $159.99 USD during this summer classic sale. Just use the promotional code “dFREEDOM” when you check out to take advantage of this sale*. For more information about dBASE™ PLUS 8 with ADO, or to purchase any of our products, visit us at http://www.dbase.com or call (607) 729-0960. 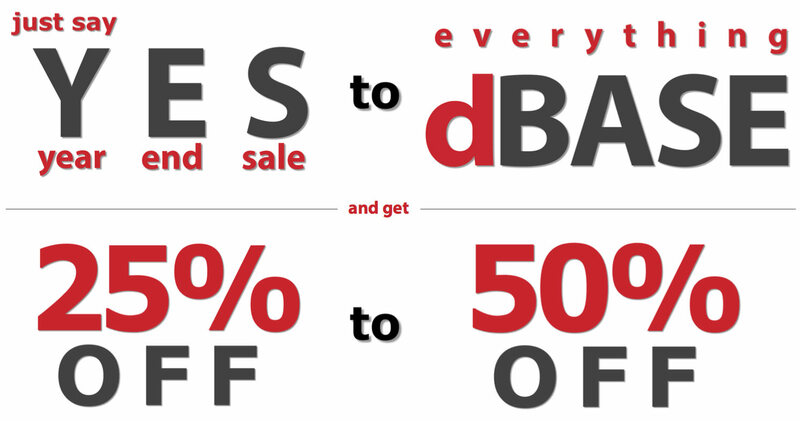 Thank you for your continued support of dBase! *Discounted prices are available only for purchases made starting at 12:00AM EDT on Monday June 24th 2013 and ending on Sunday July 7th 2013 at 11:59PM EDT. Here at dBase, LLC we realize that many dBASE solutions have been for the most part owned and operated by just a handful of talented individuals. There are times when the person responsible for maintaining the dBASE application is not available. And it always seems to be at those times, when their support is needed most. That is why for the rest of this calendar year, we are extending our training offer to include a second individual. By naming a second individual, you will both be able to attend not one, but two of our training seminars. Our goal is to help you expand your company’s dBASE expertise and protect your investment in your dBASE applications that you depend on every day. For any purchase of dBASE PLUS 2.8, Full or Upgrade made between November 1st 2012, and December 31st 2012, we will include two seats in our successful online training seminar “Working with dBASE”. Additionally, we will include two seats to our newly introduced training seminar “Migrating your dBASE programs to dBASE PLUS 2.8”. With each purchase, you will receive two invitations to each of these classes. There will be two different date options to take the “Working with dBASE” seminar. Each date will offer two different time options to better accommodate worldwide participation. The first date is set for December 6th with the seminar from 1:00 pm EST to 3:00 pm EST (GMT -5) or later that same day from 10:00 pm to 12:00 am EST (GMT -5). The second date is set for January 8th from 1:00 pm EST to 3:00 pm EST (GMT -5) or later that same day from 10:00 pm to 12:00 am EST (GMT -5). All four seminars will be presented in English. The first seminar is set for January 10th from 1:00 pm EST to 3:00 pm EST (GMT -5) or later that same day from 10:00 pm to 12:00 am EST (GMT -5). Both seminars will be presented in English. With the introduction of dbDOS earlier this year, and the reintroduction of dBASE CLASSIC™, we are proving that here at dBase, LLC, we are committed to keep your dBASE™ programs up and running well into the future. That being said, many of our customers are still very much interested in learning how to migrate their dBASE programs to the current dBASE Plus 2.8 in order to take advantage of the latest technology enhancements, as well as ensure that their programs are better positioned to withstand the test of time. Today dBase, LLC (dBase) is happy to announce a new training class for dBASE, Migrating your dBASE programs to dBASE Plus 2.8. The introductory cost of this new training seminar will be $99.00 USD for a single one-hour session. Following your purchase, you will receive a private invitation to attend one of the January 10th sessions, either at 1:00 PM EST or 10:00 PM EST. The invitation will include details on how to participate.